We love photographing Persian weddings! And the money dance or knife dance of the reception is always full of fun and laughter! The Ragsheh Chagoo is one of our favorite Persian traditions. The dance happens when it is time to cut the cake. Guests then take turns "stealing" the knife, dancing with it and taunting the couple with it in an effort to get money. Each woman takes turns dancing with the knife to get "ransom money" from the couple. Once the right price has been paid by the groom after several songs and several dances, he finally gets the knife and he slices the cake. 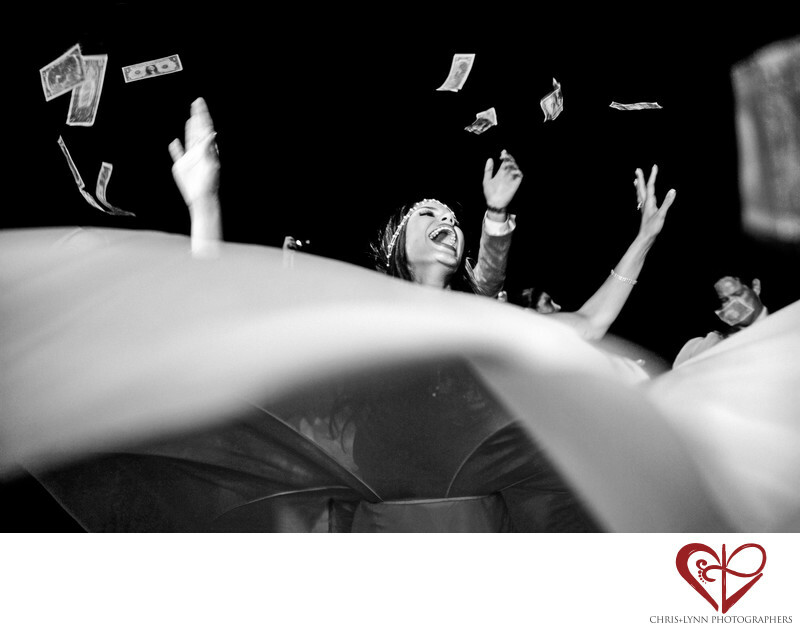 Throughout the wedding reception, there are often dances where the couple is literally showered with money by friends and relatives, symbolizing continued prosperity. This image is taken with the 16-35 Canon 2.8, the wide angle emphasizing the drama and immediacy of the moment. I love how the bride's smile is so joyful, and the way the movement in the moment is conveyed by the blur of her wedding dress and some of the dollar bills falling around her. Images like this one make us so grateful to all of the Persian couples who have given us the honor of photographing their destination weddings in Mexico. For more examples of Persian destination weddings in Cabo, please see the Featured Weddings section of the Chris+Lynn website here. Location: San Jose del Cabo, BCS, Mexico. 1/100; f/2.8; ISO 800; 24.0 mm.